Al Gore’s essay will no doubt garner a ridiculous amount of denialist rhetoric, and I am tired of it. I grew up in the 80s; a time when hippies were on the wane, Don Johnson was God, and consumerism was all about living large and keeping up with the Joneses. Despite my Irish Catholic/decidedly GOP Wayzata upbringing, upon graduation I managed to maintain an unprecedented level of liberal living. I listened to Phish, majored in art, became a vegetarian, and rebelled against Mom and Dad the best I could. But I also practiced what I preached. I adopted recycling at an early age, and insisted my family participate in the the new program instituted in our neighborhood in the late 80s. I remember my mother saying it was more expensive to recycle than to just throw everything away. Nowadays, she is an avid recycler. Back then there was anti-recycling propaganda everywhere. And now, most of us cringe when we have to throw a glass or plastic bottle into the regular trash if there is no recycling bin. Some of us even take that bottle with us to a bin at home. I also advocated organic eating. Again, to the denial of my parents (sorry M&D, but you have to admit, you didn’t believe it was truly healthier until recently — or until Oprah started advocating it), I insisted it was better for us. When I moved into my first apartment at 21, I enjoyed seeking out organic markets, and have been drinking organic milk and eating organic whenever possible and eschewing plastic since. Now, organic produce and farmers markets are in every city and supermarket, even discount markets. This is a huge turn in the right direction, though it took a movement born in the 60s to make it mainstream now, that’s about 50 years. Another idea I thought was important was urban living. I grew up in the suburbs, where everyone had their own wells, septic tanks and giant SUVs to commute thousands of miles a year. Driving 10 miles to grocery stores, 30 miles to school, and countless other miles to countless other daily activities was the norm. I thought this was a ridiculous waste, and have lived in a large metro area and higher density housing ever since I was 18. Pooling resources, biking and walking instead of driving, and buying local produce has just been a way of life for me. The mileage on my hybrid rarely exceeds 6,000 miles a year, and I have lived within 10 miles of work my entire adult life. I feel like I can speak about the subject of global warming, because, even though I am a beneficiary of the exploitation of the planet, I do what I can to personally reduce my impact. Of course, my impact is more than the impact of 10 families living in Botswana, but I care. I do what I can. And really, if more people were to make a few simple changes in their lives and their attitudes about living on Earth, we would be a better species for the Earth. We do have the ability to walk lightly without much change to our beloved ‘way of life.’ We can sacrifice an 8 cylinder engine, a huge house and some personal income for the future of our grand kids. We can live more simply and humbly just for the fact that it makes us better people. What is wrong with this? Of course, denialists are screaming about ‘government control’ and ‘legislation’ and ‘carbon tax’ etc.. They are only looking at some confusing numbers that, if laid out concisely and accurately, would show it is actually much much more conservative to ‘reduce, reuse, recycle’ than to ‘use use use and dump.’ The term ‘conservative’ in the holy sense of the word ‘is a political and social philosophy that promotes the maintenance of traditional institutions and supports, at the most, minimal and gradual change in society. Some conservatives seek to preserve things as they are, emphasizing stability and continuity, while others oppose modernism and seek a return to the way things were.’ So why are conservatives so intent on maintaining such a level of destruction? Are they really so dense as to believe that 90 million tons of pollution spewing into the air EVERY DAY will not affect the Earth in some way or another? Apparently, yes. Just take a look at any number of comments on the above article. I believe this stems from the apparent hatred of the ‘hippie’ movement of the 60s. Even though a lot of what the hippies were promoting back in the day we now accept as a normal way of life, people still have a knee jerk reaction to any word preceeded with ‘green.’ People still harass bikers, people still get incensed when talking about their SUVs. 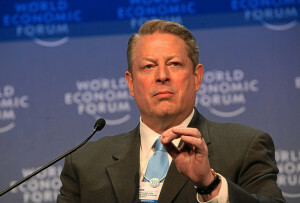 And they love to slam Al Gore, who was one of the original hippies, at the drop of a hat. The cold hard truth is, that most of what he was talking about in the ‘Inconvenient Truth’ is actually coming true. And guess what? A Nobel Prize, is still a Nobel Prize, and I don’t see a lot of the deniers with a Nobel Prize on their mantles. Yes, he is a politician, yes, he has a private jet. Get over it. If you took the same essay and put someone else’s name on it, anyone’s name, it would not get as much flack from the deniers as this article is about to get. I am VERY interested to know how many deniers or people slamming his article actually will read it in its entirety. I’m no scientist, but I chose to believe in the 98% of them who are in agreement that we are in a crisis, we are causing it, and we need to do something about it. I am very very tired of seeing all of the criticism and uninformed, creationist rhetoric surrounding this issue. It is time to put the debate aside and just f***ing do something. This debate, according to history, will rage for another 40 years before anything gets done, and sadly, by then it will be too late.